This is harder than it looks, guys. Where do we find the time? Even something as simple as Cupcake Friday – where I didn’t do any baking and I didn’t do any photographing, and all I’m doing is lusting after somebody else’s delicious creation – has proven too difficult to maintain. Every evening feels like a Friday, but every morning feels like a Monday. This die-hard tea drinker is now a coffee drinker because let’s face it, it’s faster, easier, and has more caffeine. Anyway, cupcakes! This week I’m cheating a little – these call themselves muffins. But who do they think they’re fooling? These are muffins in the sense that any cupcake without frosting is a muffin. (And by Patrick’s logic, that means we can have cupcakes for breakfast.) These make me think of the amazing chocolate soufflé I had at dinner the other night at Fleurie… But here, before I get too distracted, why don’t I just show you? Don’t you want to eat one of these right this second? I do. I want to eat five. (Three for me, two for the baby in a few hours. She only gets two because she’s little.) 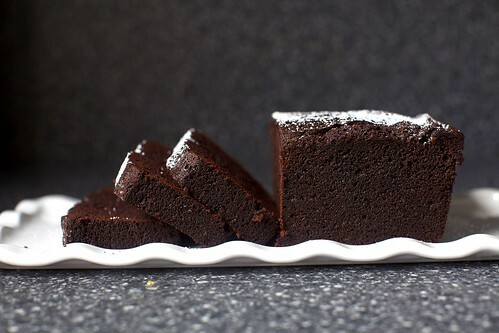 Oh man, this makes me think of my other incredibly exciting discovery of the week – another Smitten Kitchen Awesomeness – Everyday Chocolate Cake. I might have a chocolate problem. But does it get more delicious? Actually, this reminds me of a question I’ve asked myself far too many times now. What’s the last food you would ever consider giving up? What’s the food that makes life worth living? For me, it’s a hard call between chocolate and cheese, but I think cheese wins due to its versatility. But obviously I can’t fully commit to that, since I keep asking the question. What’s your one thing?